Like beer? 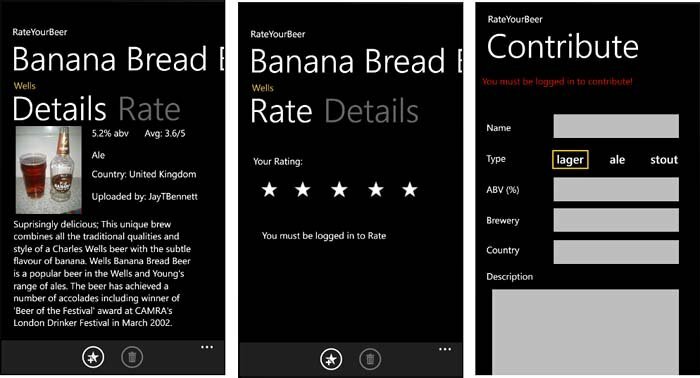 If so, take a look at the Windows Phone app RateYourBeer. It's a one stop source for beer brands and if you see something you like, you can chime in and share your comments. The app was originally released on the U.K. Windows Phone Marketplace and it has been recently unleashed on to the Marketplace in the U.S., Canada, Australia, New Zealand, Germany and France. RateYourBeer is our own Jay Bennett's home brew and was his first venture into Windows Phone development. It's a clean cut, straight forward app that presents a healthy amount of beer information. Oh, and as a way of giving back to the Windows Phone community Jay has open sourced the RateYourBeer API. Jay wanted to open up the API to everyone who might want to try their hand at Windows Phone development. You can find all the API information here at Jay's Blog and hit the break to learn more about RateYourBeer. When was there a massive explosion of beers? I never realized beer brands were so vast. Then again, when you buy beer at the local Convenience Store Bud, Miller and PBR were the brands of choice. RateYourBeer is a simple Windows Phone that will help you navigate the various brands, see what other users think of the beer, and let you rate the beer as well. Recent Page: The Recent Page displays the most recent comments and ratings on a particular beer brand. Catalogue Page: Here is your alphabetical listings of all the beers covered by RateYourBeer. The listing does have alpha tabs to help navigate around the list. Search Page: If you're looking for a particular beer brand, here is your keyword search field. Updates Page: Here you will find any information on updates to the RateYourBeer app. Along the bottom of the main pages you will find a few button controls that will let you contribute a beer listing, view your favorite beers, log into your RateYourBeer account (free), and refresh the screen. From the three-dot menu you will see links to the About Page and Settings. RateYourBeer's setting allows you to turn on/off connecting to the RateYourBeer's server via IP. When you find a beer that interests you, just tap on the listing and you will be sent to the beer page. Here you will be able to view the beers details and rate the beer yourself. Details includes the alcohol by volume percentage (abv%), the average rating, type of beer (stout, ale or lager), country of origin, and who contributed the beer. The listing page will also have a photo of the beer (often an empty glass with the bottle next to it) for a visual reference. At the bottom of the details page you have the options to tag it as a favorite or remove the favorite designation. When you find a beer that interests you that hasn't been listed, all you need to do is tap the contribute button from the main pages. You do have to be a registered with RateYourBeer (free) to add to the beer catalogue. RateYourBeer is a nicely laid out app that does offer a decent amount of information on the wide variety of beers out there. RateYourBeer is user driven in that the beers listed come from those with first hand experience with the beverages. It adds a social aspect to the app and a personal touch to the beer catalogue's listings. The app covers over 100 beers which represents a decent following (either that or someone is out there drinking a lot of beer). With the app expanding into other Marketplace regions, look for the beer listing to continue its growth. I'm waiting for the first Colt .45 listing! 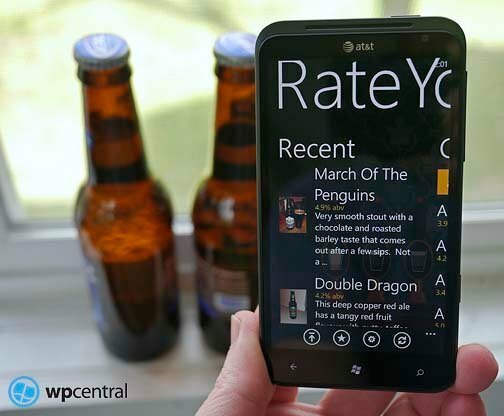 All in all, RateYourBeer is a decent app for your Windows Phone. It's not going to appeal to everyone but if you are a connoisseur of beer, it may come in handy. RateYourBeer is a free app that you can find here at the Windows Phone Marketplace.